In some countries they're known as "Bin Ladens" - the banknote everybody knows exists but few, other than criminals, ever see. Now the 500 euro note is being withdrawn from sale in the UK. Like almost all organised crime, the breakfast cereal box plan was done with the minimum of fuss. But instead of it containing the recommended daily amount of vitamins and minerals, it had been stuffed with 300,000 euros. As the undercover team from HM Revenue and Customs secretly filmed her, an ordinary estate car pulled up and the box was handed to the driver. It was another consignment of laundered drugs cash safely delivered - or so the gang thought. Symeonidoy and the rest of the 13-strong laundering gang were all later convicted and jailed. The group smashed by HMRC investigators had taken £24m of dirty money from their clients in the criminal underworld - and returned "clean" euros. Every month, they'd take in between £1m and £4m in cash - massive bags of sterling notes. They had so much of it, they had to stack it on sofas and in cabinets, and stuff it in bags in cupboards. The jailing of that gang was a major breakthrough for investigators - but it's only the tip of the money laundering iceberg which revolves around fake bureau de change and the 500 Euro banknote. 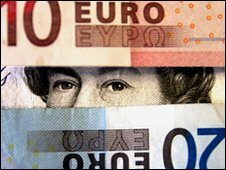 After eight months of rigorous analysis of currency trading in the UK, the Serious Organised Crime Agency (Soca) has established that the 500 euro note is at the heart of money laundering. The reason is simple: it's easier to shift. At current exchange rates, the 500 euro note is worth about £430 - eight times more than the £50 note which is the most common high value sterling denomination. If a drugs gang collects up to £1m in twenties from its clients on street corners, those notes will weigh more than 50kg - about 50 bags of sugar. The equivalent in 500 euro banknotes weighs just over 2kg. Converting it becomes a no-brainer. So the launderers set up front businesses, buy in the 500 euro notes from the City - and then make the new, clean and small consignments of notes disappear. Ian Cruxton, deputy director of Soca and head of its proceeds of crime investigations, said they tracked the note's movements and saw something odd. One suspicious exchange bureau identified by law enforcement agencies was operating out of an office that didn't even have a sign above the door. It asked the note wholesalers (the major banks and well-known international currency businesses) to supply it with four million euros worth of the bank notes in one year. Those orders were greater than the entire amount sold to travellers through the Post Office's network of 12,500 counters. "There's been a significant body of evidence over time that has recognised that high denomination notes are an important means of reducing the bulk of cash," says Mr Cruxton. 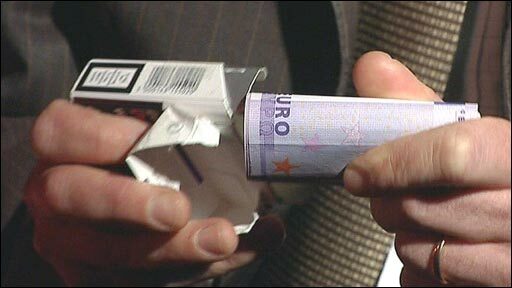 "The 500 euro note is really the note of choice among criminals. "We estimate that more than 90% of the 500 euro notes that are provided in the UK have actually gone into the hands of serious organised criminals." The 500 euro note was born in 2002. But two years before that, the similarly high-value Canadian $1,000 bill was shredded on advice from law enforcement agencies. A decade on, the 500 euro bill has taken centre stage. An internal Bank of Italy report warned last year about the mafia's use of the note, saying it was just adding to the national problems of tax evasion. And follow the money further, and you will find vast quantities of high value euros in South America in the hands of the drugs cartels. Professor Richard Portes of the Centre for Economic Policy Research, says the Eurozone countries were warned before the first note rolled off its high-tech anti-forgery printing press. "It was quite clear from day one that once they decided they would have something as large as a 500 euro note that it would give the euro an economic advantage to the $100 bill. It would be used by the Mafia and in all sorts of organised underground crime," he says. Prof Portes is pleased at the note's withdrawal from UK foreign exchanges, as it will "make life much more difficult for people who should find life difficult". But there's no plan to withdraw the banknote itself because it plays a role in the economic culture of some countries. In some nations, particularly Germany and Italy, people often prefer cash to plastic - a demand that has risen since the credit crunch hit world markets. These nations wanted a high value note euro note when they gave up their own currencies. There's no doubt high denomination notes help low-level domestic tax evasion, but that was not the responsibility of the European Central Bank. The question today, however, is whether the bank will face greater pressure to ditch the 500 note because of the evidence linking it to money laundering. In the meantime, there is a more immediate question. Will banning the sale of the 500 note in the UK do any good? Won't money launderers switch to another commodity... like the 200 euro note? Ian Cruxton of Soca says that's entirely what investigators expect the gangs to do - but there are reasons to be optimistic because they're trying to disrupt the "business practices" of organised crime and force gangs to make mistakes. "The sheer bulk of notes that they will have to move, if they continue to try to move it through cash is going to make it much more risky," says Mr Cruxton. "They're going to have to change the methods that they use, make themselves much more open to intervention. "Given the nature of organised crime, taking out isolated criminals does not bring a significant benefit. "But the opportunity to take out something like this, when we remove one of the key enablers that benefit the whole criminal community, gives us an opportunity to have a much greater effect." If we were able to use sales of the 500 Euro note to track and catch money launderers, why are we withdrawing it? I don't think this is legal. I have been abroad and I take 3000 euros in my money belt, in 500 notes, and it is completely concealed. 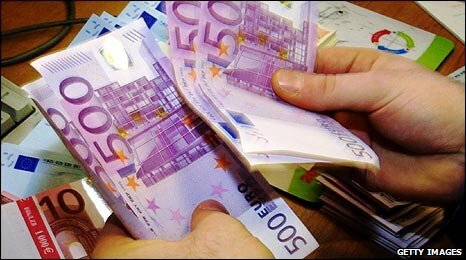 It seems very very stupid to ban the 500 Euro note if 90% are used by criminals, the police seem to have cut off one way of following the illegal money. It appears that the police are not very interested in money laundering. So next all the $100 US C-Notes will be banned. This stinks. What about honest businessmen like myself who have financial interest in Spain and Italy yet reside in the UK? Who require euros to be sent back home to Iran my home country without the dictatorial regime knowing? The UK/US wont let the Iranian banks in London do anything so they have to increase the price of remitting money back home. You take Dollars to Iran no one will accept it, you take Sterling or low denomination Euros and you get an unfair haircut. The only note which makes most economic sense is the 500 euro note. Please do not ban it because of criminals when we who pay taxes and earn money legally require it as well. In retrospect, given that the circulation of the £50 note in the UK is regarded as a barometer for the size of the Black Economy, the fact that there existed a note worth eight times that in value should have been concern enough nearly a decade after its introduction that it would be used for illicit purposes. Using the same logic, the 200-Euro note should be culled as well. The only other reason to have it would be that it would be available should the real value of the Euro plummet due to hyperinflation. So the Canadians learned the hard way that these very high denomination notes are more use to criminals than honest people. What does Brussels do? Ignore the lessons and produce their own. Just how much EU tax payers money has been wasted on something that ought to have been obvious anyway? Very well but what about the Swiss 1000 chf note The Swiss banks don't care from where the money comes from or where it goes, and as there is no enforced border its perfect for money laundering, being worth about 650 pounds sterling.